This Envisat image shows the island of Elba off Italy’s north western coast. This Envisat image shows the island of Elba off Italy’s north western coast in this stunning space wallpaper. To the east is the Italian mainland and region of Tuscany, while the small island of Pianosa is visible in the lower-left corner. 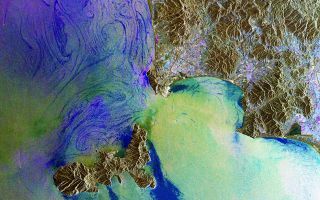 This image is a compilation of three Envisat radar images acquired on 29 November 2008, 7 February 2009 and 21 August 2010. Each image is given a colour – red, green and blue – and combined to produce this representation. Colours reveal changes between the satellite’s passes. In fact, the populated areas on Italy’s mainland appear very colourful. This shows that the land, buildings and roads changed over the three-year period. Changes in the sea surface are also evident.